What if you could gain a couple of watts just by improving the shape of your calves? That’s what our Speedwear Concept Aero Tubes are all about. This piece of equipment has been developed to improve airflow over the legs and is ideally suited for time trialists and triathletes looking for ways to shave off seconds from their record splits. The aero tubes are positioned over the calves and thank’s to the compression of the fabric, the frontal area is reduced. The Airstripe fabric used in the tubes creates a low pressure wake and reduces drag. The wide elastic Powerband cuff on top keeps the tubes nicely into position. 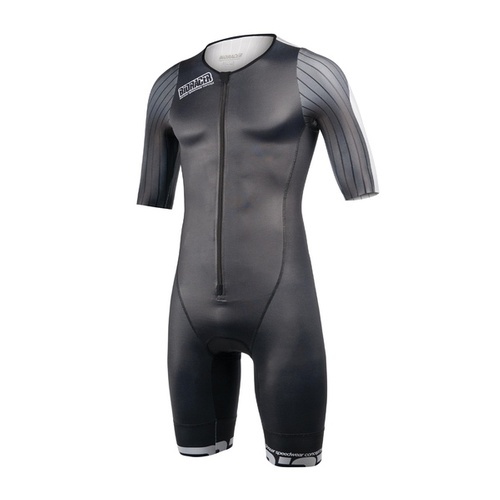 Aero calf covers for time trialists and triathletes.